By youtuber Francois Dior who notes: The goofy idea for this song came when watching my Jack Russell terrier playing in the back yard. Hope you enjoy! If you love to watch videos here as much as we do, you know we can't get enough of pretty little 'Gypsie.' Here she is getting ready for Christmas. By youtubers Chaîne de Julia and Gypsie who want to add: Have a wonderful Christmas. Enjoy every single moment with your family, friends and pets! Now go ahead and turn up the volume! Have you got those gifts wrapped yet? 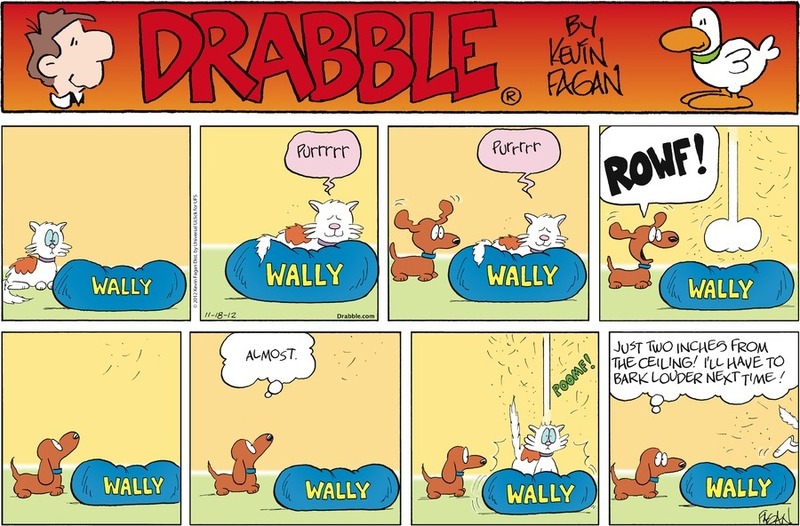 Thanks as always to our pretty pal 'Princess Lea,' who hails all the way from Slovenia, for keeping us up to date all year long with the latest adventures of Wally in Drabble, by Kevin Fagan. So, you thought your Christmas was a tough one? Wait 'til you hear about mine! It began early in the morning - much earlier than I am used to being disturbed. But all of a sudden my two sisters and myself were pulled out of our warm bed and three pairs of hands started to brush us and wash our faces and clean our ears. I even had two toenails clipped. I should have known right then and there that this was the day our mother had been telling us about. She kept saying we were all going to other homes. In fact, she kind of gave me a complex about the whole thing. Every so often she's let out a snide crack like, "I don't see why one of you couldn't have been beautiful like me. Then you could have stayed here." You see Mother never quite got over the fact that she won all kinds of prizes in some beauty contests. There's a whole cabinet at the other end of the room filled with silver cups and dishes and things. She won them all - or so she told us. Well, it was pretty obvious that this was the big day. I was put in a box that was awfully dark inside when they closed it. However, it had a couple of holes punched in it so I could get some air. I got air all right - it was plain drafty and for a long time after we got into the "wagon" I sat and shivered. I know it was a "wagon" 'cause I heard that nice guy, Johnny, who used to feed me, say, "This old wagon needs a good going over. I believe the battery is about shot." After a while, I was lifted up in my box and the next thing I knew everything was bright around me. Four persons were staring at me. One was a man with a silly grin on his face. One was a woman, who looked as if she had tears in her eyes. 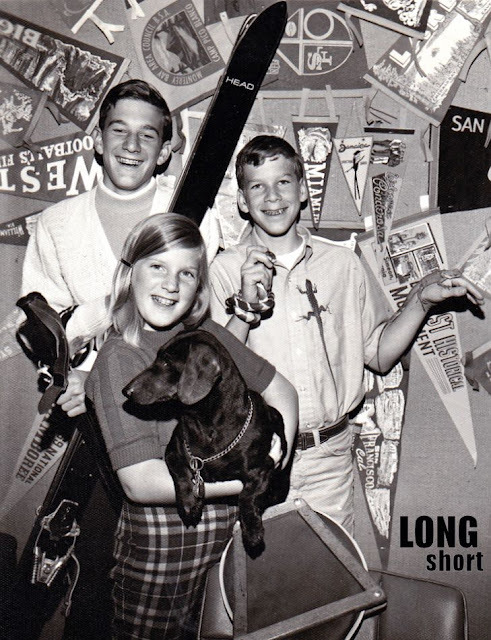 Then there were these two kids - a girl with long golden pig tails and a smart aleck freckled-faced boy that I knew right away was going to give me a hard time. The woman lifted me out of the box, held me against her shoulder and kissed me - yes, she actually kissed me. Now, I don't go much for this sloppy stuff - so I started to wiggle. Wouldn't you? Next she handed me to the man, who gave me a playful pat on the rear end - only it wasn't very playful to me. That guy has a mitt like a rock. Next the little girl took me and somehow I got my left foot tangled in one of her pigtails and it took everybody to get it loose while she let out a long loud wail. All the time that freckled-faced boy kept leering at me. This pawing and squealing and loud talking seemed to go on forever. Finally, one of them, I forget which one, put me down on the floor and I took off. I ran to the nearest hiding place, which was in back of a big tree in the room. Then you should have heard it! Everybody was on their knees trying to coax me out. But I had made up my mind. This was a bunch of kooks! Just when I was feeling safe, that freckled-faced kid lay on his belly, reached under the tree and grabbed me by the back of the neck. I let out a yelp and that started the noise all over again till the lady said, "Stop, you're hurting the little darling. Give him to me." Would you believe it, this sort of thing went on for hours. One of them put some milk in a dish and insisted that I drink it. But I didn't want it. Then they dipped my nose in it. I honestly thought they were trying to drown me....and did I struggle! At another point, that freckled-faced kid kept rolling a big ball at me and I kept running away from it. What do you think he was trying to do? Then, all of a sudden, someone decided to take me outside. So the two kids put on some coats and hats and took me outside and stood me on the cold ground. There I stood and shivered. I was thinking, "What kind of a nuthouse did I get into?" Well, whatever they wanted to happen didn't happen so after a while they took me back in the house. I was no sooner inside when I had to go - you know - go. So I looked around but I couldn't find any paper. Now paper is a very necessary thing at a time like this. But there was none. So I just went. If you think they were noisy before, you should have heard them this time. I don't know what they were so upset about. It certainly wasn't my fault if there wasn't any paper around. Sometime later, they gave me a dish with some food in it. I tasted it and it was pretty good stuff, so I ate some. That started it again! This time everybody was happy. Boy, I'll never get used to this crowd. Oh, yes, I almost forgot to tell you. Early in the day someone asked what my name was and.....this you won't believe.....even I don't believe it.....the answer was Hector. Imagine, Hector! Well, I've got news for them. If they think for one minute that I'm going to pay any attention to that freak name, they have another jolt coming. 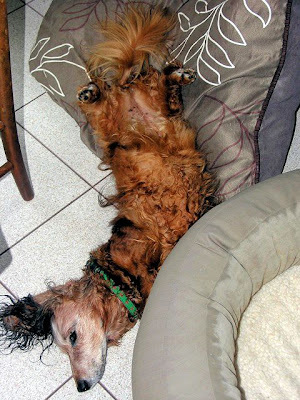 I did manage to get through the day somehow but it wasn't easy....and boy, was I tired when they finally put me in a nice soft bed.....kinda like a basket....and everything got quiet. I'll just bet they thought I would object to being alone....but I fooled them. I was darned glad to be rid of them. The last one that said goodnight was the freckled-faced kid. He kinda jabbed me in the belly with a fat finger. He and I are going to have a showdown one of these days....I can just tell it. 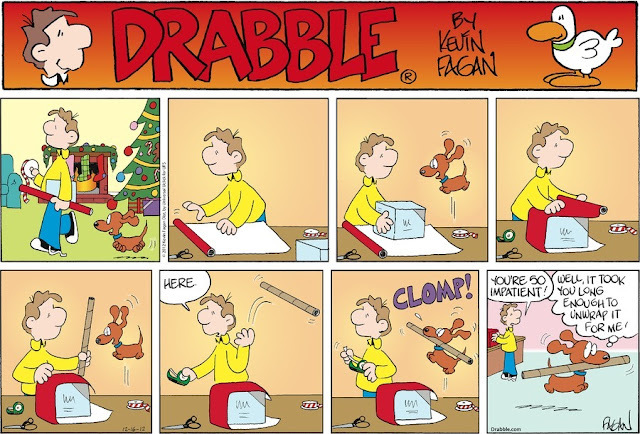 So you thought your Christmas was a rough one! 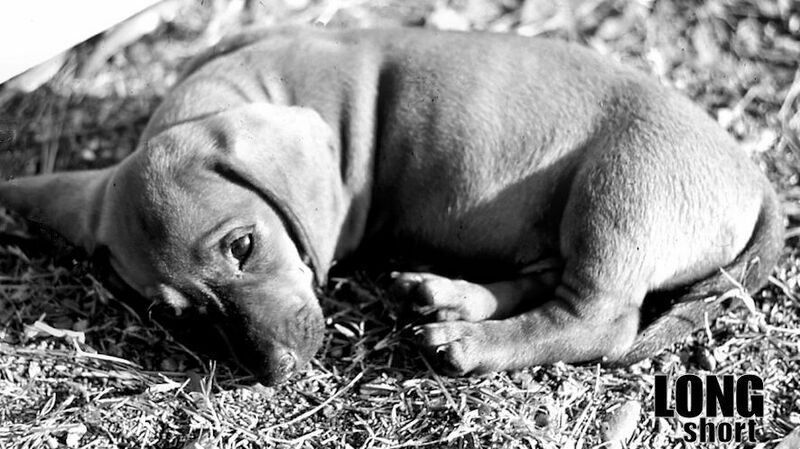 How would you like to be a 10-week-old Dachshund puppy? This article was originally printed in The Reading Times, December 26, 1969, and then re-printed in the December, 1970 American Dachshund magazine, and now, typed out once more for the readers of The Long and Short of it All, December 15, 2012. Vintage photo circa 1950-60, source unknown. 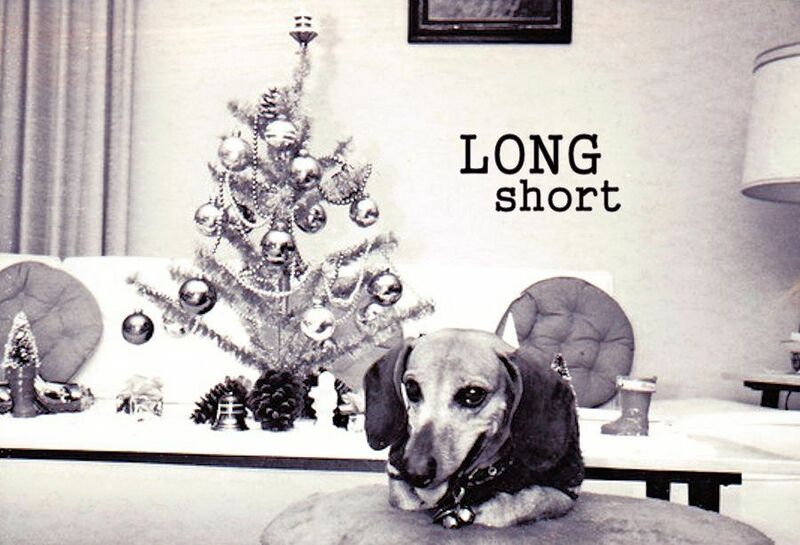 Wait - Wirehair Wednesday was yesterday! But we couldn't wait until next week to share this heartwarming holiday gem. We went to see Santa the other day (we being Koko and Hershey) and stopped at the Bath and Body Works while at the mall (yes we only go to the see the REAL Santa at the mall, who by the way mentioned that he has doxies too but they were home with Mrs. Claus so we didn't get to meet them). 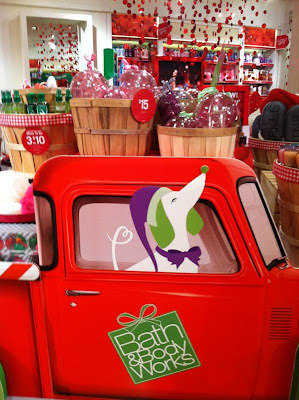 Imagine our delight in seeing that there were dashing dachshunds displayed around the store! 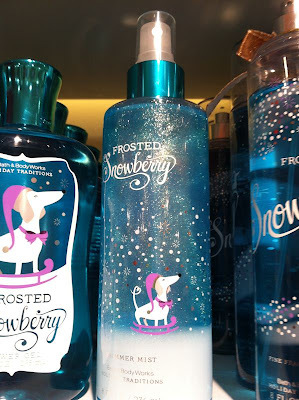 They even have a new fragrance for the holidays called Frosted Snowberry that has a little white wiener dog on the bottles! Our Momma took pictures for us to send you. We enjoy reading your blog and want to wish you a Merry Christmas! Thanks to all the folks who sent us links to this funny little video - we can't even list everyone for fear we'd leave someone out! Have a nice Wirehair Wednesday. Rowdy will. Thanks to our pretty pal 'Princess Lea' for sending this in. She notes that "Wally seems to be on a roll this week!" As seen at the local Party City in Charlotte, North Carolina. 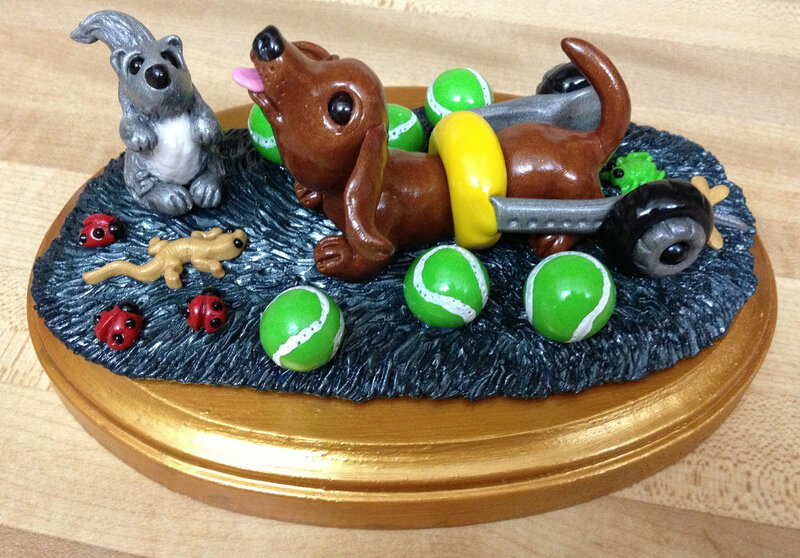 Thanks to an Anonymous Dachshundist for sending this in! Thanks to the Slovenian Prnicess 'Lea' for keeping us up to date with another new Drabble. Will there be yet another one tomorrow? Stay tuned. As you busily sort out your shopping list, pen your Christmas cards, plan your holiday soirée, and scrape up some cash to donate to your favorite charity this season, don't forget your local Dachshund or Animal Rescue organization. 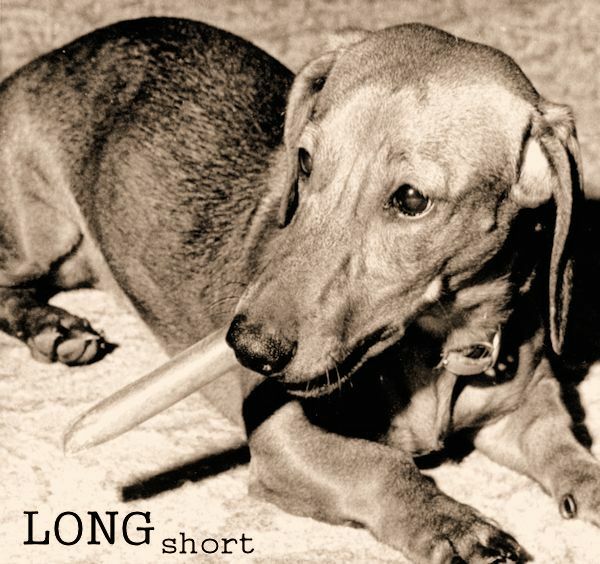 We're lucky to have one of the finest Dachshund rescue organizations in the country to help out our local long dogs, Rowdy's alma mater, MidWest Dachshund Rescue. Please give generously to the folks who work tirelessly all year long to rescue, vet, foster, and re-home the Dachshunds and dogs who are in the greatest need. On behalf of the many foster home, volunteers and contributors of MDWR, we are pleased to report that 2012 has been our most successful year. 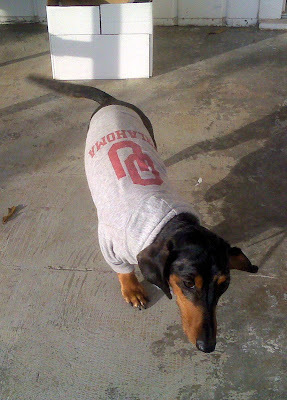 We have helped 249 dachshunds from puppy mills, shelters, abandoned dogs and owner surrenders. Our volunteers have driven thousands of miles with one goal in mind, to help dogs without the good fortune of being raised and cared for in loving homes or those that have found themselves homeless through no fault of their own. We wish to express our deepest appreciation to our donors whose contributions and in-kind donations have been key to our efforts. We also appreciate the many animal care providers who helped our dogs throughout the year. Our deepest gratitude goes to our volunteers who helped us transport, foster, and care for all the dogs who came to MWDR in 2012. MWDR is especially grateful to the many people who adopted our dogs in 2012, and who welcomed the dogs into loving homes. Finally MWDR remembers all the wonderful little dogs who came our way and who provided us with hope and strength as we watch their tails wag and receive their appreciative kisses, and unconditional love. We are hopeful to expand our funding and volunteer base in 2013 to be able to help more dogs and connect them with even more loving homes. Thank you for being part of the MWDR family. Wishing you all a happy, safe and healthy 2013! I created this sculpture to benefit Dodgerslist; 100% of proceeds from this sale will go to this group to help with all the wonderful work that they do as a volunteer-based team. 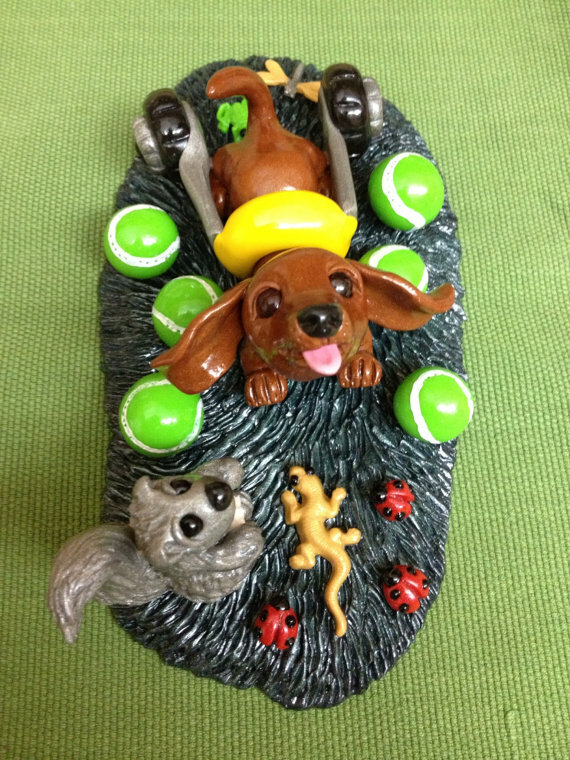 The red doxie in this piece is so full of life; rolling happily on wheels chasing a squirrel and lizard, and waiting for someone to throw tennis balls and play catch! Hand sculpted, painted, and detailed from premium quality clay; all of my creations go through multiple steps of hardening, and finished with several layers of water based coat. You'll be amazed at every little detail.... It is a product of an intensive labor of love. 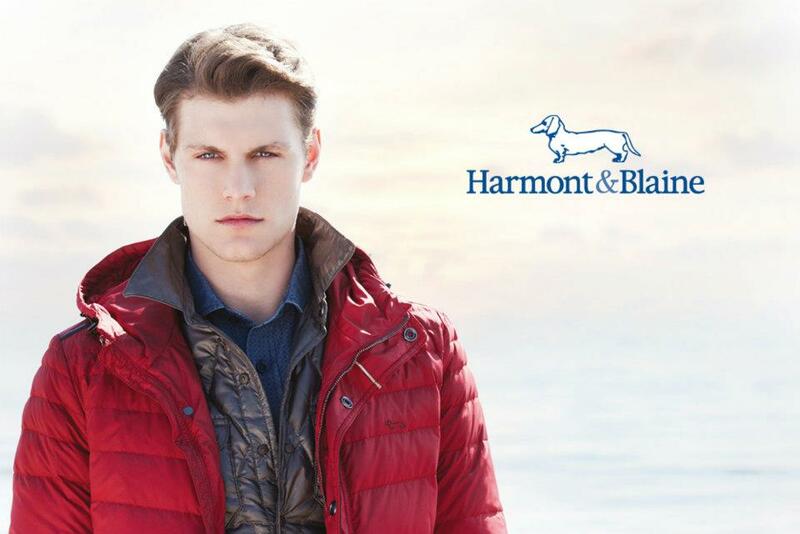 This heirloom quality piece can also be easily dusted with a clean, damp cloth. Remember that a disabled dog is not aware of their limitations; they just continue to live their lives as any normal dog would. It is our responsibility to give them a life full of quality, fun, and love. IVDD is not a death sentence, it's just a bump on the road. With proper care and nutrition, a 'down' dog can live through their life expectancy just as a normal dog would. It's never too early to learn about IVDD. Go to http://www.dodgerslist.com/ for a wealth of information, referrals, support, and success stories. We've got a feeling that this piece won't last long, especially at just a $79 donation. Head on over to etsy when you can. Thanks as always to our Slovenian Princess, 'Lea' for sending in the latest Drabble. She says "water is always better anywhere else than in the bowl." Pictures of the things we like to do. Scott's reptiles, you see, skiing and tennis -- all great! She's long wanted to get in this act - you can bet! Our thoughts go to the family and friends we hold dear. ...the Happiest of New Years! Mid-Century Christmas Greeting Card Source Unknown. Two large craters appeared in the surface of the 1.5 mile lane between Somerby and the hamlet of Newbold, making it impassable to most vehicles. Highways engineers examined the damage on Friday and say the road will be shut for at least three weeks. 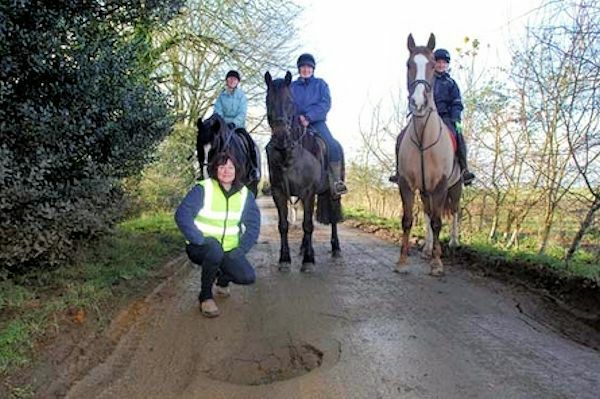 The subsidence was discovered by horse riders from the nearby Somerby Equestrian Centre. Horse owner, Katie Jones, who keeps a pony at the centre, said: "The road collapsed just over a week ago. You can see where badgers have dug a hole next to the carriageway. "It has collapsed and the road surface has fallen in. The same has happened on the other side of the lane." "One side of the road collapsed when someone from the centre was walking past. "The other side collapsed after a vehicle drove over it." A spokesman for Leicestershire County Council said: "We are investigating the damage which has been caused to the road and we are in discussions with Natural England, the Government's adviser on the natural environment, as to the next course of action. Or, an even simpler solution would be to just get some good Badger Hounds. I wept tears of sympathy as I read your tale of the endless wait for dinner. I endure the same torture every single day and it is almost more than I can bear. Here I am, recuperating after a delicious chicken breakfast. I have two luxurious beds, but sometimes I would rather sleep between them than on them. I am now going on 17, so I pretty much do whatever I want and Mom doesn't argue with me. I wish you and Rowdy a wonderful Christmas, filled with love - and food, of course. Me and Rowdy wait all day for Dad to come home. Boy, is that an exciting time. We've been busy all day barking at intruders at the back door, telling it like it is to the squirrel eating at the feeder outside the window, and of course keeping tabs on anyone who might possibly think of ringing our buzzer. We play for awhile, we sun for awhile, we chew on that leftover treat he left us for awhile, then the time comes....he's home.....he pulled into the driveway, that was the beep of the car alarm...He's HOME! That means FOOD! That means a WALK! He greets us with an equal air of enthusiasm - this is the best time of the day! He grabs some treats and a poop bag and a leash for my little brother Rowdy. 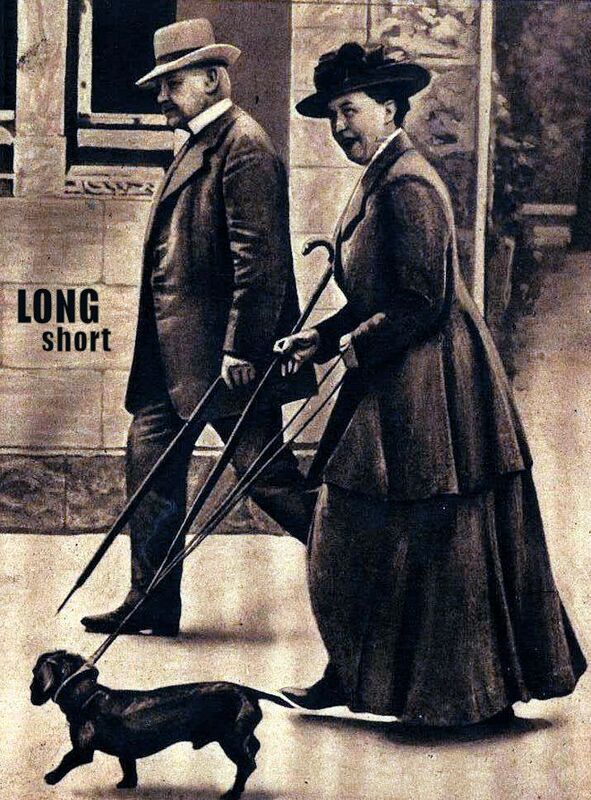 I'm such a good boy that I don't need no stinkin' leash - really. We go for a 25 minute walk to greet everyone in the neighborhood coming home from work and to brighten their otherwise mundane day. Finally back at the house, I know that soon it will be dinnertime. I've waited 12 hours since the last "feeding." But instead of pulling our frozen raw meat out of the freezer, he stops to fill a glass with ice for his tea. Then he invites us to step outside on the porch so he can survey our estate. I don't want to go on the porch with him, this is just a delay tactic to get my dinner. With much reluctance, I finally agree to go with him and Rowdy after his incessant prodding. Back inside once more, he finally steps toward the freezer and pulls out the frozen meat. Oh, yes. What will it be tonight? Lamb, chicken, beef, fish, venison, goat, tripe? I don't care what it is, just make it quick. He pulls a frozen patty from the bag - looks like duck! What a nice surprise. 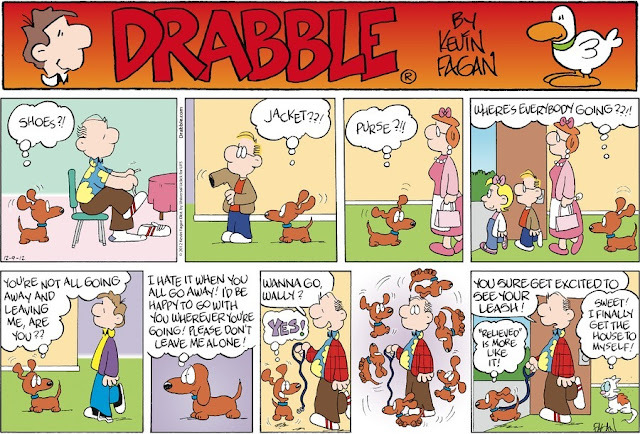 I wag my tail enthusiastically. He sets the frozen patty on a plate and prepares to thaw it in the microwave. Alas - this waiting is killing me. Kibble would be so much more efficient and quicker. The new microwave takes six minutes and twenty seven seconds on the defrost setting to thaw our food. The old microwave took only two minutes and thirty nine seconds. That's progress for you. I'm getting impatient. I've stopped wagging my tail because this is taking so long. I stare at him coldly with disgust. I look at Rowdy and roll my eyes. The microwave finally beeps. YES! But I'm tired of waiting. He pulls the thawed meat patty out of the microwave and asks us if we're hungry with a big smile on his face. You think? I can't stand his patronizing. I'm so excited at this point knowing that dinner is just a few moments away I think I'll just explode. For reasons known only to me, I go into what he refers to as "the zone." I'm so excited that I can't even watch him take the meat patty and split it up for me and Rowdy. I leave the kitchen and walk to the end of the hallway and I just stand there, frozen, in the greatest anticipation. A little drool escapes my jowls. I can't even wag my tail I'm so serious in the fact that dinner is almost ready. My head is going to pop off my long agile body. Will I get more tonight than I did last night? Will I get a bigger portion than Rowdy? Will he add yogurt? Will he top it off with salmon oil? I hear him humming calmly as he mixes the food in the plates. What do I do now? Logically, I know that only seconds have gone by since I've waited at the end of the hall, but it must be an eternity and it's just too nerve-wracking so I head into the bathroom. I whip back the shower curtain with my large schnoz and jump inside the tub. Surely I will find solace here until the next few seconds when I hear him call me, finally, for dinner. Then I hear him walk down the hall...Nooooo! Keep working on that dinner. 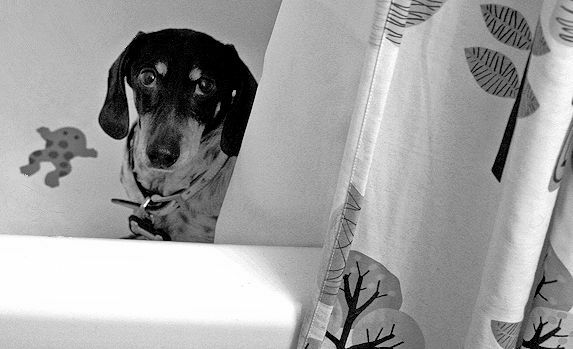 He eyes me in the bathtub, my eyes filled with utter apprehension. He smiles, and get this - he actually takes precious time to grab a camera, and takes the above photo of me! Are you freaking kidding me? You're going to share my insecurities with the world? It's not funny in the slightest. He laughs at my anguish but I know in the back of my head that I am Joey and victory will soon be mine. He steps back into the kitchen and then I hear it: that final clinking of the fork against the plate. Clink Clink Clink! He calls it "Pavlov's clink." I rush out of the bathtub knowing that my sustenance is finally at hand. It's really just seconds now. He asks me to sit. I oblige him. It's finally here. Oh yes, oh yes, oh YES! My dinner! My beloved dinner. 9 seconds...8, 7, 6, 5, 4, 3, 2, 1....and it's all gone, just like that. I lick my lips. I keep licking the plate in hopes that more will miraculously appear. He asks me if it was good. I wag my tail. All is right with the world. And now I wait. Just 12 hours to the next feeding. 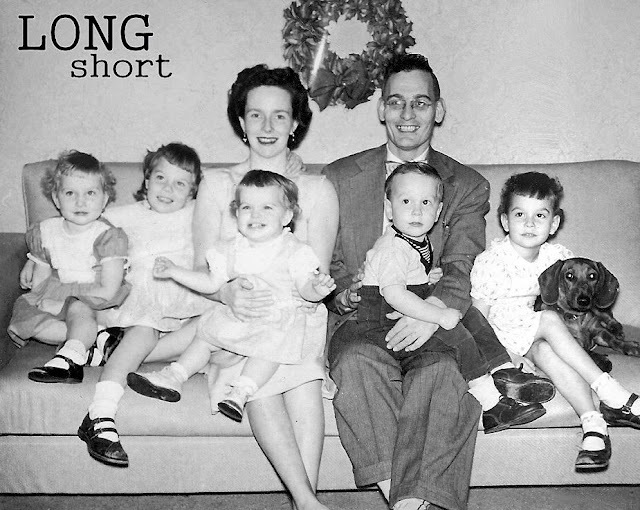 Katie Crosley has endured her fair share of hardship. Her son, Jace, was born with a heart defect. Early Sunday morning smoke and flames consumed their Grady County cabin. Katie and Jace woke up to a wailing Dachshund. A genuine miracle, she believes, considering “True,” their pet dog is blind, deaf and only has three legs. An electrical short ignited a fireball on the front porch, barricading Katie and Jace inside. They navigated through the smoke and out the back. The fire victims lost everything, including all the baby supplies they had just collected. 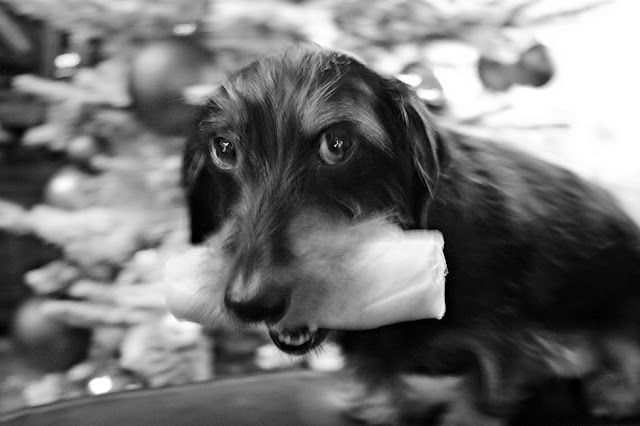 There is little left here and yet, Katie is grateful for so many things, mostly the disabled Dachshund nobody wanted. An animal rescue that somehow returned the favor. 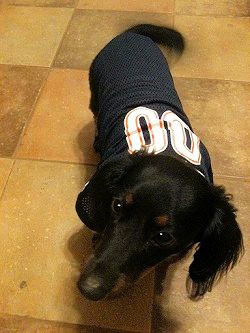 In case there is any confusion out there, it's not dash-hound, dashund, doxin, or daxin. 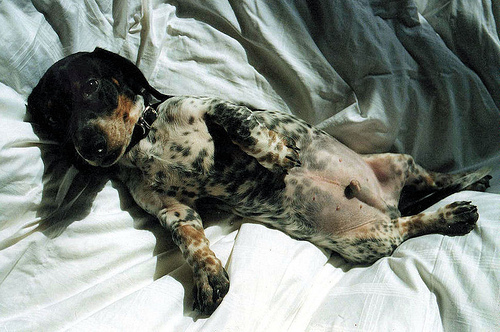 It's Dachshund. But honestly though, we really don't care what you call us as long as you don't call us late for dinner. Really. 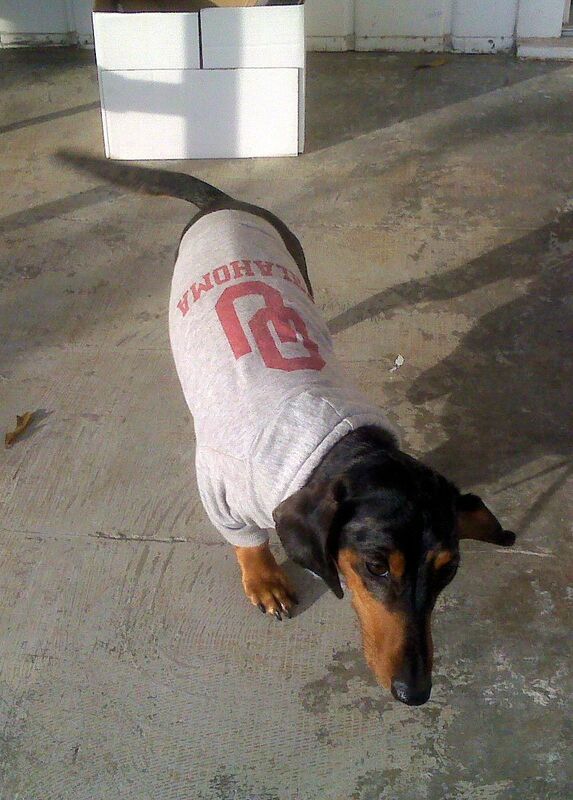 Thanks to our friend Denise for sending us the latest Jack in the Box commercial featuring Dachshunds! We love it! 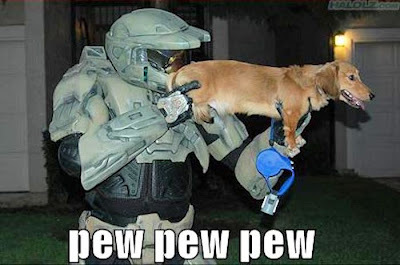 And almost like clockwork, our friend Natalie sent this funny viral photo in. We honestly haven't been so excited about Dachshund Weaponry since the excellent short film Worn Peace. Paul Ludwig Hans Anton von Beneckendorff und von Hindenburg, known universally as Paul von Hindenburg, 2 October 1847 – 2 August 1934, was a Prussian-German field marshal, statesman, and politician, and served as the second President of Germany from 1925 to 1934. Hindenburg is commonly remembered as the man who as German President appointed Nazi leader Adolf Hitler as Chancellor of Germany. Hindenburg personally despised Hitler, condescendingly referring to Hitler as that "Bohemian corporal". Hitler repeatedly and forcefully pressured Hindenburg to appoint him as Chancellor, Hindenburg repeatedly refused Hitler's demand. Though 84 years old and in poor health, Hindenburg was persuaded to run for re-election in 1932, as he was considered the only candidate who could defeat Adolf Hitler. Hindenburg was re-elected in a runoff. Although he was opposing Hitler, the deteriorating political stability of the Weimar Republic let him play an important role in the Nazi Party's rise to power. He dissolved the parliament twice in 1932 and eventually appointed Hitler as Chancellor in January 1933. In February, he issued the Reichstag Fire Decree which suspended various civil liberties, and in March he signed the Enabling Act, in which the parliament gave Hitler's administration legislative powers. Hindenburg died the following year, after which Hitler declared the office of President vacant and, as "Führer und Reichskanzler", made himself head of state. The famed zeppelin Hindenburg that was destroyed by fire in 1937 was named in his honor. Oh yeah, he was a Dachshund Lover. Vintage photo circa 1919, source unknown. Have you finished putting up that tree yet? I'm quite proud of mine. This is a special thank-you to all the Dachshunds who send us news tips. We can't always write back via email, and many times stories don't make it to the site - there just aren't enough hours in the day it seems. But we couldn't put out a quality Dachshund news site if it weren't for our Roving Reporters all over the world who send us the latest news as they see it. Thank you. 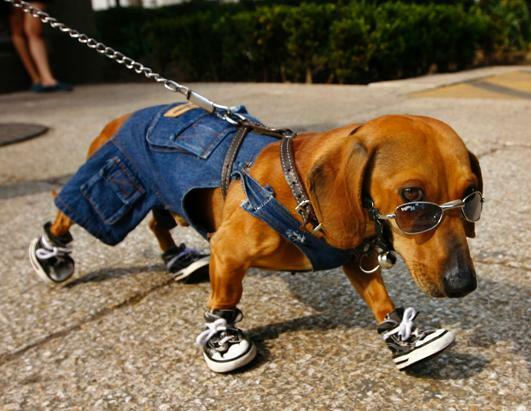 Here's a sampling of these wiener dogs in-the-know. Above, Tucker sniffs out news whenever he can. 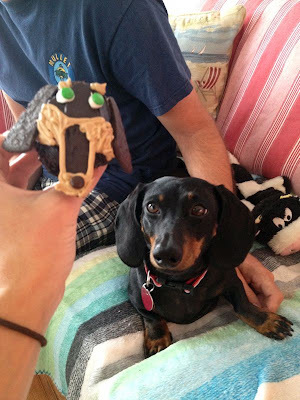 He's seen here with the Dachshund Cupcake in his likeness from the book Hello, Cupcake! Finally, 'Rosco P. Dog' recently threw us a bone with some news and had this to say about the upcoming Thanksgiving holiday: I hope everything is going well this holiday season. I am getting pretty excited about Thanksgiving, or Dachshund Day as I call it. I call it Dachshund Day because 15 people come visit me, pet me, and then feed me the most wonderful food. Ha! You're right Rosco, Turkey Day is so last Millennium. 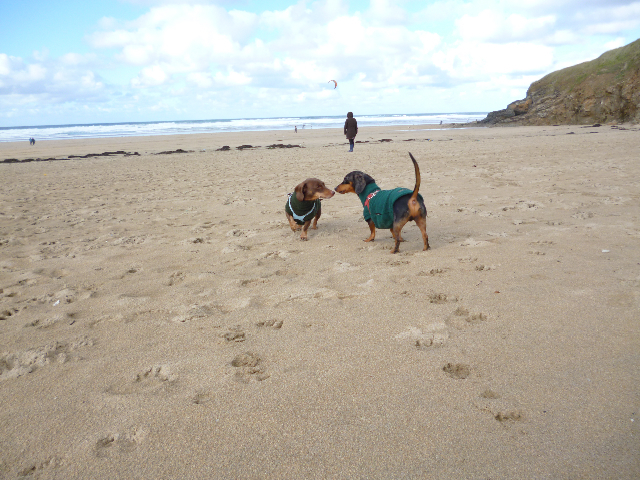 Dachshund Day it is! This was on the front page of our Fremont Tribune today. We know you've featured this mole-hunting wizard before and would like to know that he has passed on at the age of 13. If moles had the ability to understand the news, they might be breathing a collective sigh of relief. But this is a sad time for Fremonters Dale and Betty Reandeau and others who loved Bubba. 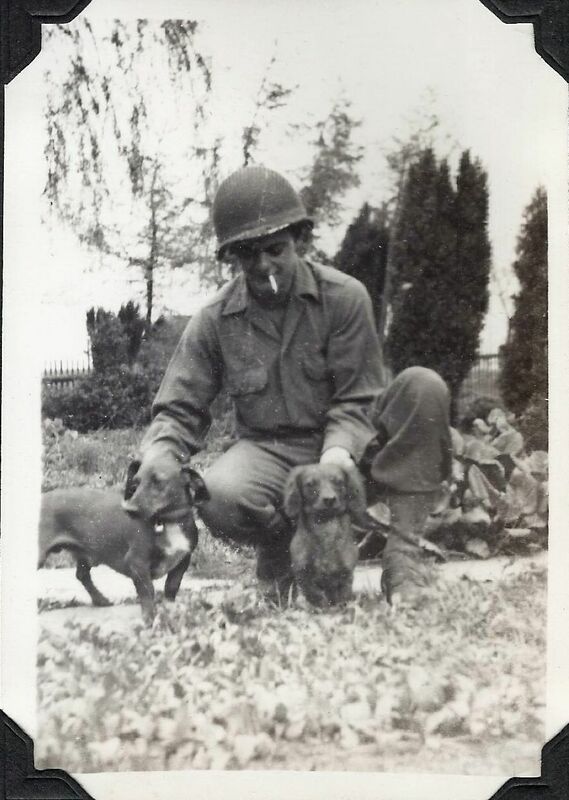 The Reandeaus’ miniature dachshund — estimated to have rid Ridge Cemetery of more than 600 moles throughout the years — died Saturday. He was 13. The little dog had been ill before his death. Bubba had Cushing’s disease and pancreatitis, Dale Reandeau said. Bubba’s mole-hunting efforts had diminished in recent times. 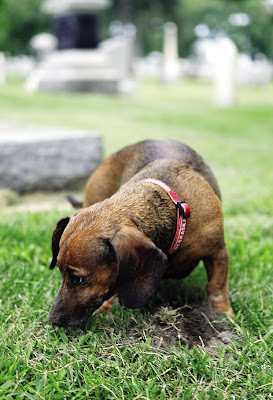 Bubba’s mole-hunting endeavors began years ago while the Reandeaus took him on walks in the cemetery. Before that, moles were a headache for then-cemetery sexton Jim Clarke. Almost like a second career, Bubba became a lean, mean mole-hunting machine. 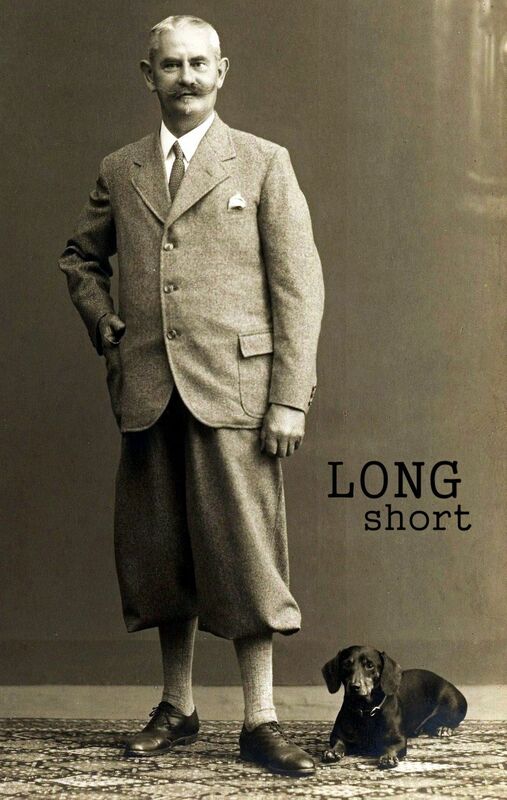 Clarke estimates the dog killed about 100 moles a year and Bubba became a celebrity of sorts. The Reandeaus got comments from people in other parts of the state after The Associated Press picked up a Fremont Tribune story about the dog. “Bubba became even more beloved by Fremont citizens, because he was part of the cemetery historical tours. His owners would bring him and tell his story,” said Cherrie Clarke, cemetery historian. The Reandeaus will miss their pet. Dale, 80, doesn’t know if they’ll get another. 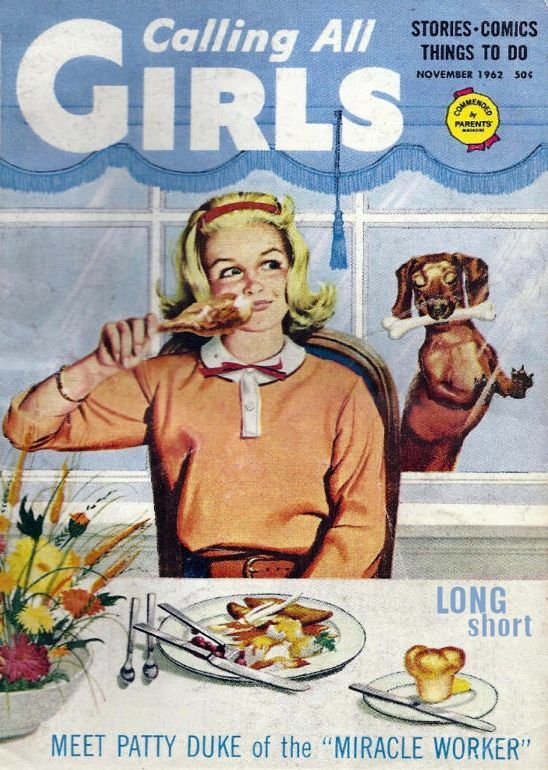 At first, Betty said “no more dogs.” He’s hoping she’ll reconsider. “Maybe next spring we’ll get another dog. I hope so,” he said. In the meantime, the Reandeaus and others are remembering the perky pup. Rest in Peace little guy. Read more of this story at the Fremont Tribune. Related: Oct 1, 2010: Holy Moly - Bubba Sets Another Mole-Hunting Record! 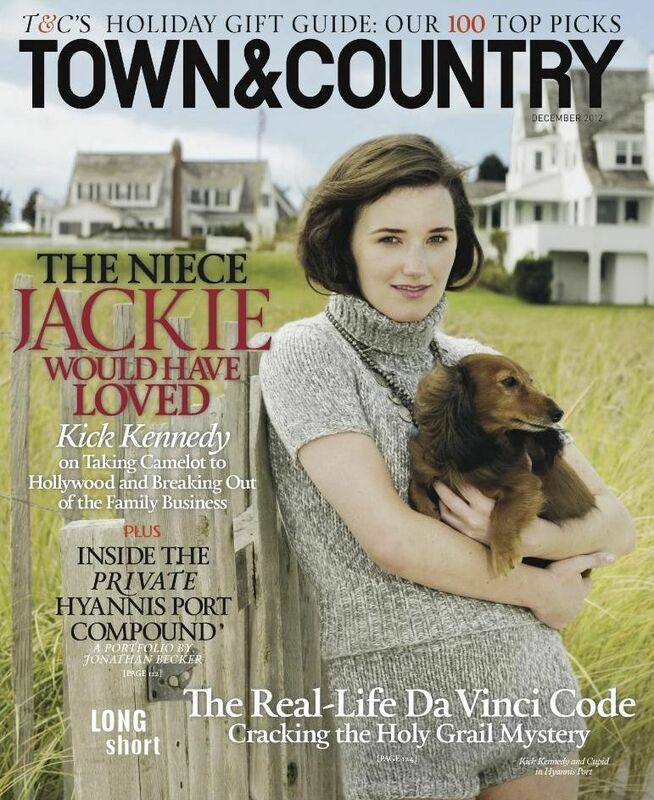 Kick Kennedy - RFK's granddaughter, committed environmentalist, budding actress - is shaking up the compound with laughter and her own sense of purpose. Kick and her dachshund Cupid at the Kennedy compound in Hyannis Port. Michael Kors sweater ($1,395) and shorts ($795). You can find another photo of Kick and Cupid in the magazine on sale now. 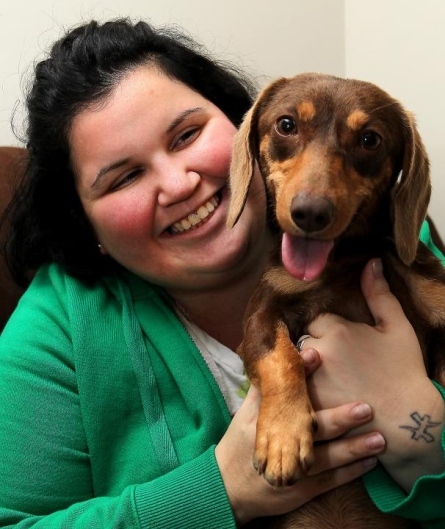 Oh Yes You CAN Catch Me: Stray Dachshund Living In Woods For Five Months Reunited With Human! Smiles everyone, SMILES! Norma Jean is reunited with her human. Norma Jean, N.J. for short, eluded people for more than five months while living in the woods beside Regal Cinema in Franklin Square. Various people tried to coax her to their cars – whistling, waving food, bringing other dogs. Nothing worked. 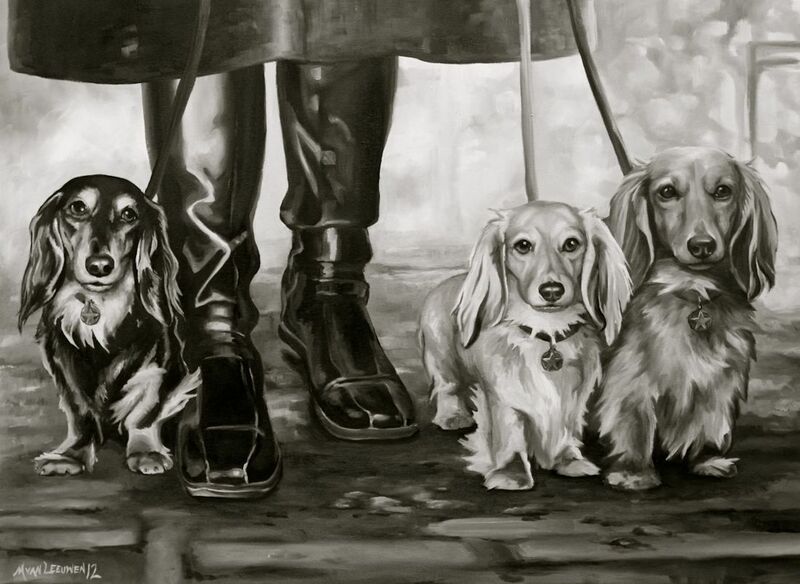 Christina Baucom’s dogs, N.J. and Skynyrd, were like her children. But the family was divided when Baucom and her husband split up. Forced to move from her home into an apartment, Baucom was faced with a dilemma. She couldn’t afford the $250 pet deposit and additional monthly fees to take her dogs with her. Skynyrd went to an old high school friend of Baucom’s, and N.J. moved in with a woman who said she’d provide a good home. Over several months Baucom kept track of Skynyrd on Facebook, but N.J.’s new owner would never respond to messages. Baucom glanced at The Gazette front page Thursday and gasped. N.J.’s picture was prominently placed on the page, and the article described her dog as homeless. A police officer stayed with her a while, suggesting she leave something behind so that N.J. would smell it and remember her scent. Baucom put out a blanket and went home. Sleeping seemed impossible. 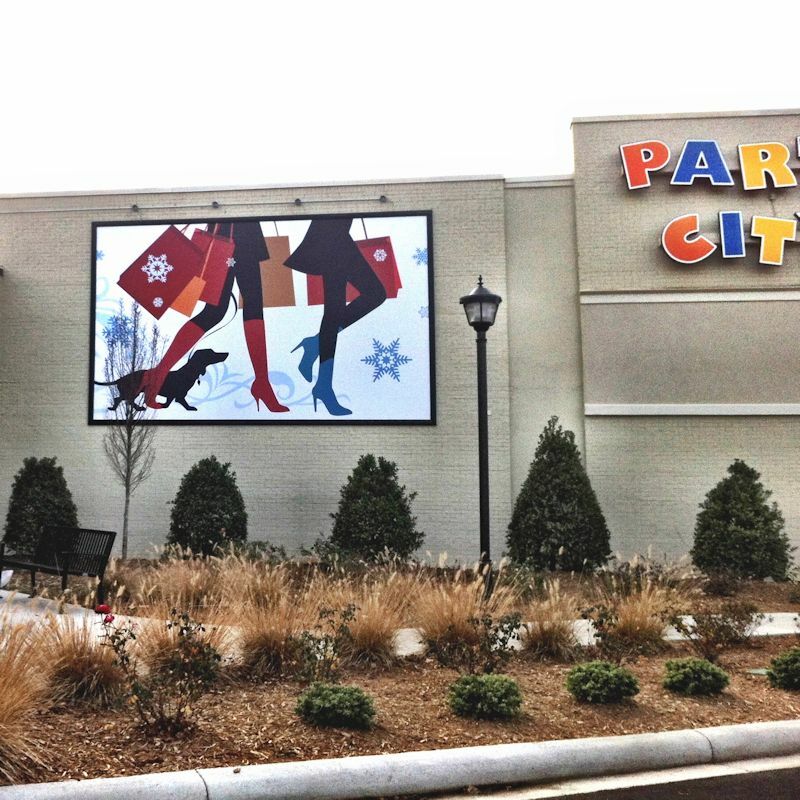 Baucom drove back to the theater around 1:30 a.m. Friday, but crowds from the midnight showing of “Breaking Dawn: Part 2” filled the parking lot. Baucom returned at 6:30 a.m. to make another attempt before work. N.J. wasn’t visible. 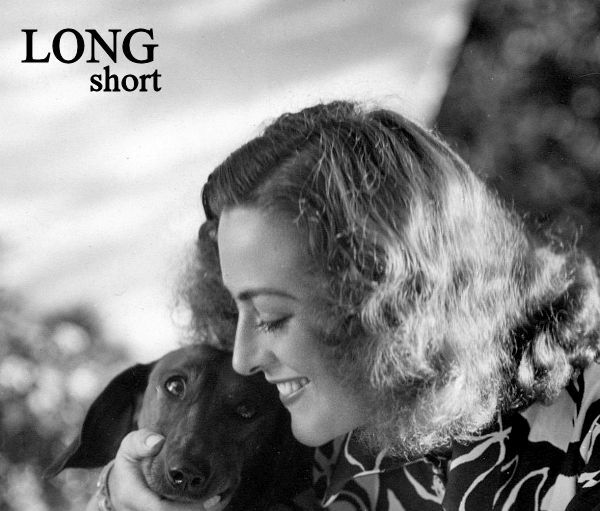 N.J. ran full speed ahead, jumped in Baucom’s lap and licked her face. One person has offered to pay the dog’s initial vet bills to get her vaccines caught up. Others say they want to pitch in to pay Baucom’s pet deposit fees. Tears streamed down Baucom’s face as she described holding N.J. again, and feeling the warmth of the kindness of strangers. Thanks so much to our pal 'Caya' for sending in the link to this wonderful reunion. You can read more about it at the Gaston Gazette. Thanks to our friend, The Slovenian Princess 'Lea,' for awaking from her beauty sleep and sending us the latest Drabble! Go ahead and turn up the volume, enlarge the screen, and Have a Great Friday. 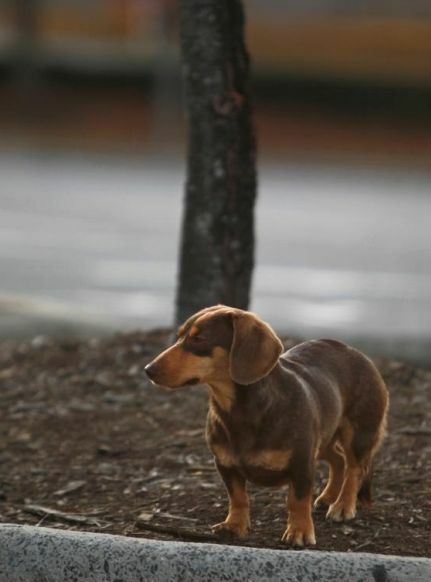 You Can't Catch Me: Stray Dachshund Eludes Authorities and Community for Five Months! Gaston County Animal Control officers have made multiple attempts to lay their hands on the dog, to no avail. 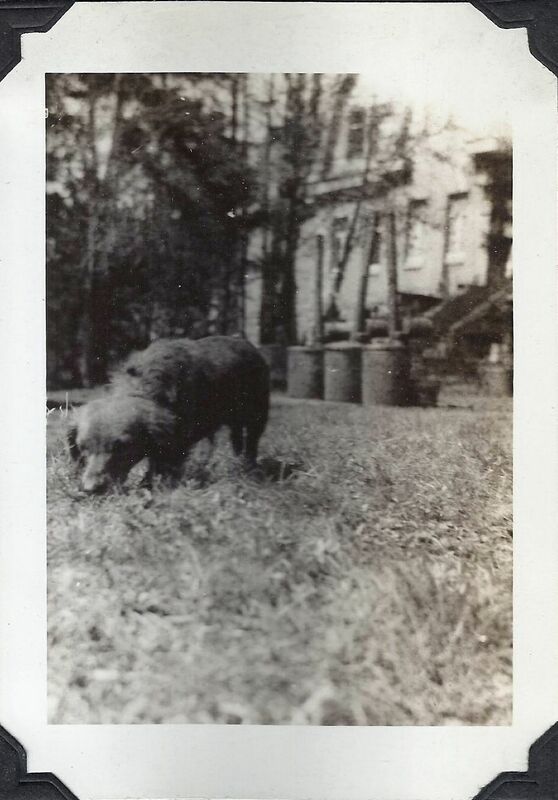 Several dog lovers also tried to capture the canine – bringing food and attempting to gain her trust. The amount of attention the dog has gotten is atypical, according to Steve Rhyne with animal control. He guessed that her sweet appearance paired with a busy shopping center as the reason she’s become so popular. Animal Control officers make regular stops to check up on the dog and attempt to capture her. Capt. Scott Bates drives by practically every morning, often bringing some of his dogs’ treats. She won’t take the bait. In fact, the dog often turns her nose up at Bates’ dog bones. He said other visitors feed the pup more tantalizing morsels. 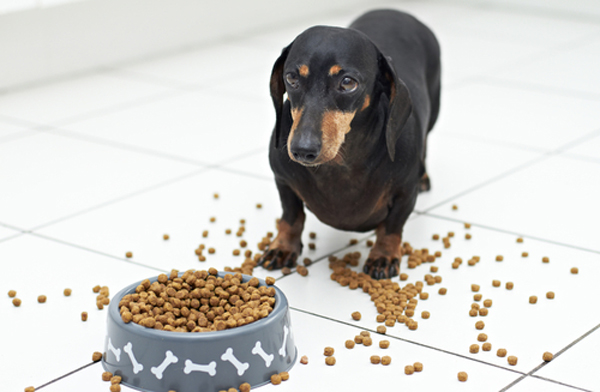 Hamburgers and table scraps may be why the animal isn’t interested in the dog food put in traps by Animal Control. “It’s definitely not going to go in a trap when it’s getting sausage biscuits from Bojangles’,” said Rhyne. The animal lives back in the woods that border I-85. Officers can’t easily chase the dog into the thicket of kudzu and briars. Read much more on this story at The Gaston Gazette. 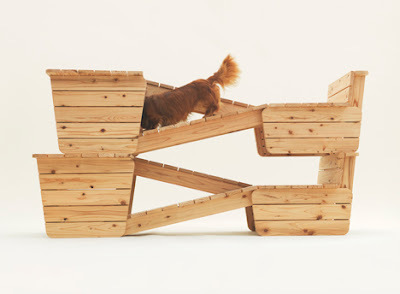 Architects and designers have designed a series of downloadable architectural structures that are just for dogs. Organised by Kenya Hara, the creative director of MUJI, Architecture for Dogs is an open-source network where dog-owners can download the templates for each of the thirteen designs, then build them for themselves. Each designer was asked to think up a structure that would alter the way that people interact with their pet, so Atelier Bow-Wow have designed a ramp for a Dachshund that helps it make eye contact with its owner, in spite of its short legs. “We thought about stairs, but their bodies are too long and they risk hurting their hips,” said the architects, explaining their design for a folding slope. So humans get busy - the designs are free! We highly encourage you all to make a visit to Architecture For Dogs - the site is simply amazing and will leave you with a big giant smile if nothing else. Really. A red smooth Dachshund named 'Coffe' walks with his owner along Reforma Avenue in Mexico City, Nov. 11, 2012. Thousands of cyclists, skaters, pedestrians and pets take over Mexico City's avenues during "bicycle Sundays." (Marco Ugarte/AP Photo) Via Today in Pictures, ABC News. As American author and poet Maya Angelou quoted of our armed service veterans: How important it is for us to recognize and celebrate our heroes and she-roes! 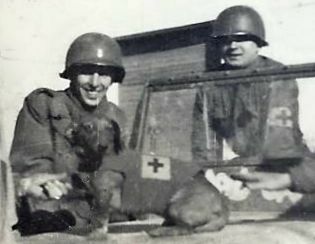 - we at The Long and Short of it All pause to recognize not only our veterans, but the Dachshunds who stood by their side. Long-time readers of The Long and Short of it All know that we take extra time and effort to post military-inspired Dachshund photos and stories on Memorial Day and Veterans Day. Today we bring you these historic WW2 photos that we scanned from the collection of our country cousin 'Rudy.' His Dad is a big collector of WW2 memorabilia, and thought we might enjoy these. Boy, do we! The captions noted here were written by Mrs. Heinz. Click any photo to enlarge and admire. Taken at Manderfeld at Krewinkle. 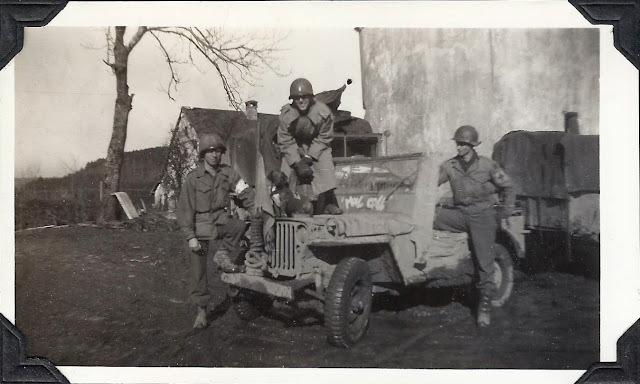 L to R: Byron Billings from 3rd Bn Aid Station (has Bronze Star), Harold, "Booby Trap," Sgt Martin, Harold's Jeep "Mail Call." 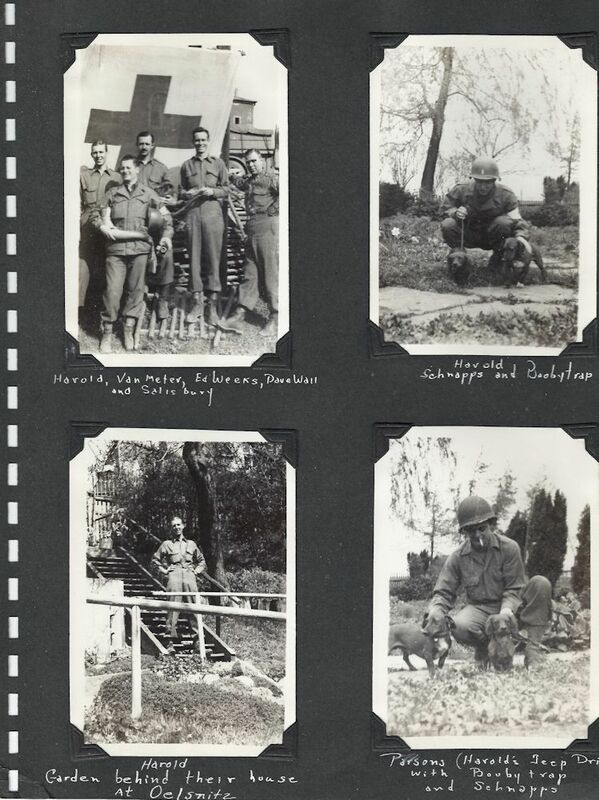 This is what the photos looked like in several pages of Mrs. Heinz' collection. Awesome, right? 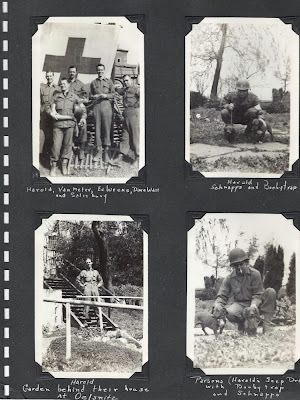 There is another photo here with Schnapps, Booby Trap, and Harold Heinz in the upper right, just click to enlarge. 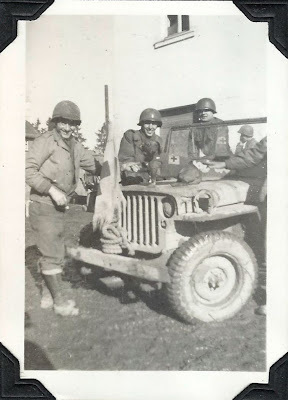 Have a great Veterans Day. We're so proud, some folks actually DO read our little blog here! Thanks so much for sticking with us over the years and giving us a shout out. 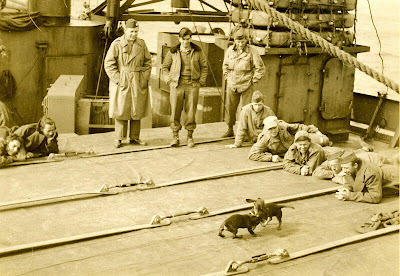 We hinted a few weeks ago that Dachshund UN, Australian artist Bennett Miller's traveling art installation, was about to make its way to the North American continent as a part of The 2013 World Stage season at Toronto's Harbourfront Centre. Some Dachshunds took note, and have already auditioned to take part! We're so jealous of you Canadians, you're gonna have such a great time. From the video notes: Last Sunday a handful of owners and their pups met with the creator of Dachshund UN, Bennett Miller, at Paws Way. By now you may have heard that the performance that "stretches the boundaries of ... live art" will be making it's North American debut here at Harbourfront Centre as part of the 2013 World Stage season. The owners were very excited to meet Bennett and potentially be a part of this exciting show. Find out more about the event at the Harbourfront Centre. 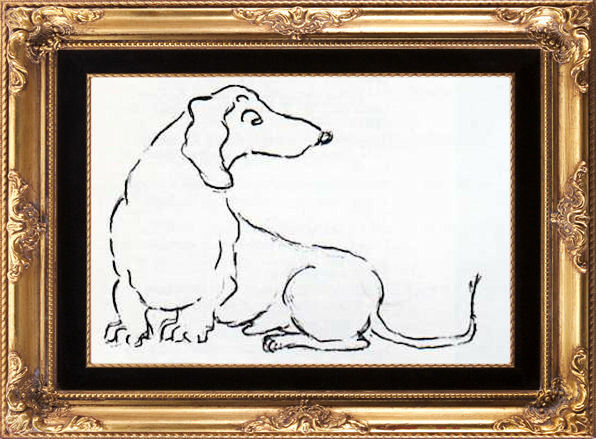 We first posted this installment of Uncle Peterfritz's Lively Tails for Little Dachsies way back in November of 2008. Have you been with us all these years? We find that our archives really have some hidden gems, and this tale is especially poignant with the recent election - so enjoy, here it is again. Don't forget to VOTE! That did it! Within minutes there wasn't a whelp that hadn't joined the war; tails were slapping down faster than you could count, red mud and black mud filled the air, and by the time the adult dogs came rushing up to stop the fight there was nothing to distinguish one whelp from another - or from what was left of the swamp itself, for that matter. Dearest Gentle Reader: do you tire of the meager offerings set forth by our humdrum age? Do you seek to cultivate blooms of refinement and joy in your life's garden? Find Dachshund Love and transcend the banalities of modern existence and transform yourself into a living work of art. Very early 1900s German photo source unknown. We always love a good doggie reunion story. It just goes to show that you can never give up hope. Here, an 11-year-old Dachshund Mix named 'Tinkerbell' from Rocky Mount, Virginia, goes astray and ends up missing for 6 months. She was finally found some 70 miles from her home and reunited with her family by surprise at an adoption event! Via WCSH.